To provide customers with the ability to engineer monoclonal antibodies Oxford Genetics has produced sets of vectors which contain antibody heavy and light chains. 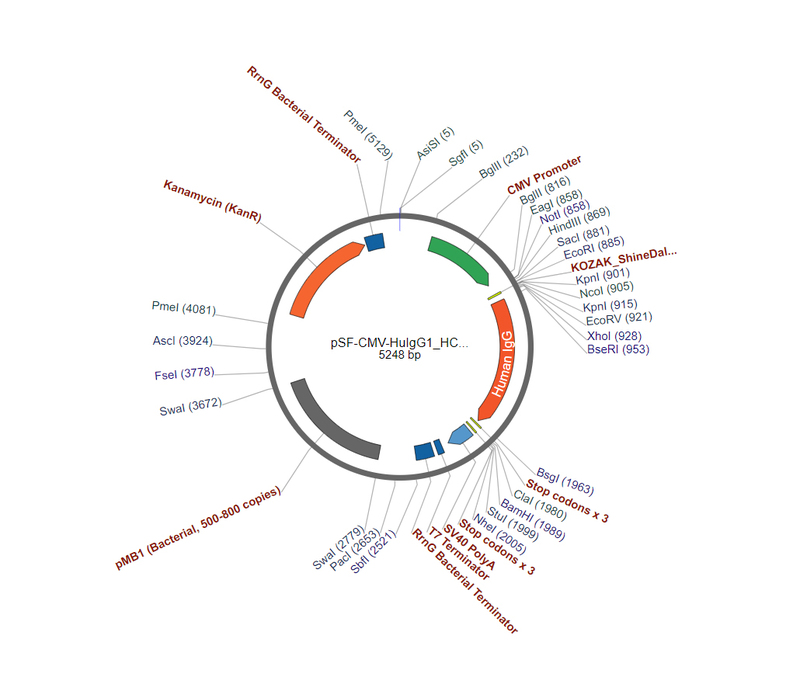 These plasmids also contain a multiple cloning site (MCS) upstream of the heavy or light chain to allow insertion of variable region and/or secretory signal peptide sequences. Human IgG Vector Set - This collection of plasmids enables you to engineer monoclonal expression of your chosen human antibody. The plasmids encode the constant regions of human IgG1 heavy chain and of both lambda and kappa light chains, providing a framework for you to insert the variable regions of your choice (see image of human heavy chain expression plasmid). Mouse IgG Vector Set - This collection of plasmids enables you to engineer monoclonal expression of your chosen mouse antibody. The plasmids encode the constant regions of mouse IgG1 heavy chain and of both lambda and kappa light chains. Simply insert your variable regions and begin screening. Rat IgG Vector Set - This collection of plasmids enables you to engineer monoclonal expression of your chosen rat antibody. The plasmids encode the constant regions of rat IgG1 heavy chain and of both lambda and kappa light chains, providing a framework for you to insert the variable regions of your choice. research grade cell lines for biomanufacture.